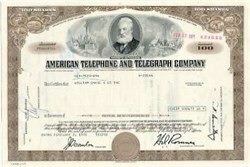 Beautifully engraved Stock Certificate from the American Telephone and Telegraph Company issued no later than 1971 and is over 32 years old. This certificate has an ornate border around it with vignettes of Alexander Graham Bell, Inventor of the Telephone, a metropolitan city with a map of the world in the Background, and a large radio tower in a rural community. The certificate has a printed signature of the company's Chairman of the Board and Treasurer. It also has the company's corporate seal dated 1885 at the bottom center.